When Bill Clinton suggested last week that Mitt Romney’s position on the auto bailout must have caused his father, former Michigan Governor George Romney, to be “turning over in his grave,” he was being deliberately provocative. But he was also being too kind. After all, it’s not just Mitt’s stance on auto manufacturing that would have caused his father grief. He has repeatedly cited his father as his greatest personal and political influence, and his principal motivation in seeking the presidency, as best anyone can determine, is to avenge his father’s failed 1968 attempt; yet the irony of Mitt’s campaign is that, despite his heartfelt loyalty to George’s memory, he seems to lack any real understanding of, or sympathy for, his father’s principles. SQUINT A LITTLE and Mitt looks a lot like his father, with the same lantern jaw, large forehead, and dark upswept hair graying at the temples. Mitt also resembles Romney père in his devout Mormon faith and business success before entering politics. 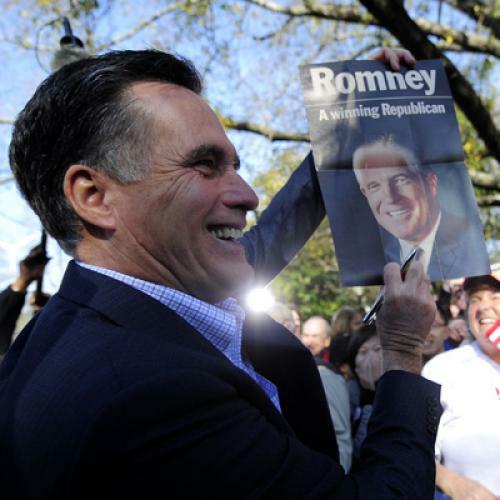 And both Romneys acquired a reputation as pragmatic Republican governors, George in Michigan, and Mitt in Massachusetts. But the apparent similarities between the two Romneys turn out, upon closer inspection, to be sources of difference. While both father and son were deeply influenced by their Mormon upbringing, for example, George was more strongly marked by the religion’s turbulent origins. George was born in a Mormon colony in Mexico founded by his grandfathers, who had fled the United States rather than abandon the practice of polygamy. He was one of the 207 grandchildren of those prolific patriarchs. His parents, who were not polygamous, lost everything when Mexican rebels confiscated their property. They returned destitute to the U.S., and George experienced poverty and hard labor while growing up. Mitt, by contrast, was raised in affluence, and the family history of exile and struggle was only a distant ancestral memory. And while both Romneys enjoyed successful business careers, George’s leadership of the American Motors Corporation (AMC) gave him a very different skill-set from Mitt’s at the private-equity firm Bain Capital. Mitt never attempted to take to the airwaves to try to change consumers’ thinking, as George did in his efforts to sell the public on the merits of compact cars such as the AMC Rambler, or to engage in the give-and-take of slugging it out with unions. George’s flesh-pressing efforts to win over auto workers on the factory floor gave him a comfort with personal interactions with ordinary voters that his son seems to lack. Mitt’s Harvard pedigree also means that he gets more respect from the media than his father did; many reporters considered George stupid on account of his religiosity and lack of a college degree. But Mitt’s career has isolated him from contact with anyone who is not similarly rich, well-educated, or Mormon. This isolation, combined with his apparent lack of the emotional intelligence that George Romney had in spades, has hurt him politically. Much of Mitt Romney’s approach at Bain was devoted to overthrowing the business philosophy of men like his father. George Romney made his name as an opponent of Big Business and Big Labor alike. He called for decentralizing economic power and extending capitalism’s benefits to a broad cross-section of society, through profit-sharing for workers and consumer-driven anti-monopoly regulation. Mitt, on the other hand, propagated the view that a company’s sole purpose was to increase shareholder value. His efficiency gospel, reinforced through the threat of leveraged buyouts, preached that the benefits of productivity increases should go not to workers but to upper management. His encouragement of the practice of giving top managers large equity stakes in their companies gave an enormous boost to executive pay packages, so that CEOs now earn more than 300 times the wages of the average worker. George Romney spurned this kind of self-interested elitism. As AMC’s chief executive he repeatedly refused increases in his salary, bonuses, and stock compensation. He called on Americans to reject self-indulgence and excess, and would have taken a dim view of Mitt and the other principals of Bain Capital posing for a photo with dollar bills bursting out of their suits. George believed that businesses had social responsibilities to the communities they served. He devoted much of his own time to public service to his city and state. He helped to desegregate Detroit’s public housing in the 1940s, improve the city’s public schools in the 1950s, and reform Michigan’s constitution in the early 1960s. The American Motors Corporation was rooted in Detroit, while financial companies like Bain that scour the globe in search of profit are as rootless as capital itself. In 2010, Detroit authorities tore down Mitt Romney’s childhood home, as part of the city’s desperate efforts to salvage its once-prosperous, now-decaying neighborhoods by knocking down vacant buildings. Asked for comment, Mitt replied that Detroit’s decay was the consequence of liberal social policies; somehow one can’t imagine George Romney scoring political points off his hometown’s decline. Both Romneys were known for being fiscally prudent but socially tolerant governors, who won over independents and some Democratic voters, worked well with opposition leaders, and caught flak from conservatives. But aside from his creative and bipartisan efforts to broaden medical coverage for all the citizens of Massachusetts, Mitt’s moderation amounted to little more than mere pragmatism. Republican moderation has lost force and substance since the movement that defined it faded in the 1970s. George Romney was fiscally conservative but also a passionate advocate of civil rights and civil liberties, prudent internationalism, and government programs to give every American a fair chance at success. If Mitt supports any such progressive positions, he hasn’t done much to advertise it. It’s also difficult to picture him emulating his father’s battles against conservatives like Barry Goldwater, his interest in the political dissent of the late 1960s, his outreach efforts to inner-city ghettos, and his efforts to attract minority voters to the GOP. Mitt Romney is more politically savvy than his father was. So far he has avoided the gaffes that torpedoed his father’s presidential campaign, particularly George’s admission that he had been “brainwashed” into his initial acceptance of U.S. military policy in Vietnam. If Romney is, indeed, nominated by the GOP, he will have attained something that his father never had. George would undoubtedly admire his son’s successes—but it’s unlikely he would applaud how he achieved them.